Hello. My name is Clarke and I'm an addict. Steam is both a blessing and a burden. They've trained their customers to always hop on a deal. 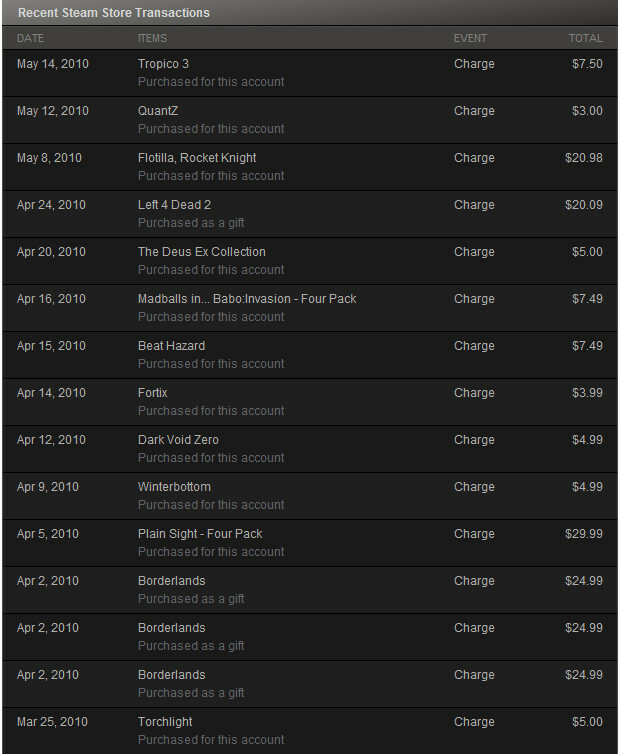 It seems every week I'm always buying something from the Steam store. The above photo is just a sample of my recent purchases. 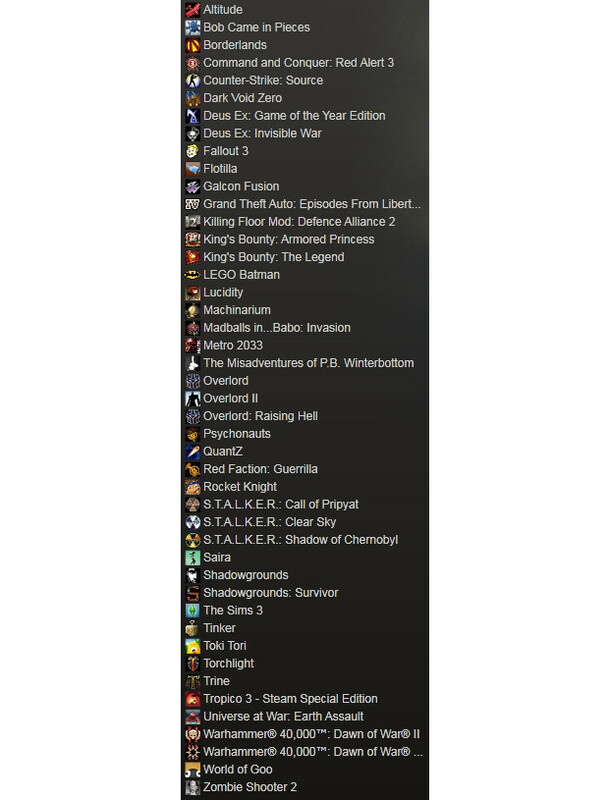 I didn't check over them when taking the screenshot but I'm pretty sure I haven't played most of those games. Even worse is when I buy extra content for games that I am currently finishing. It seems like every time I beat one game I end up buying 2 more to take its place. I'm starting this blog series to hopefully motivate me to complete all my games and make my purchases worthwhile. I have strange gaming habits though. I had Mass Effect on my computer for a while but wasn't motivated to start playing till the sequel came out. When it did release however I blasted through both games back to back in a weekend. In contrast to that I have all of the S.T.A.L.K.E.R. games but have barely taken 3 steps in S.T.A.L.K.E.R. : Shadow of Chernobyl. Well enough babbling time for the games. Here is a picture of the games that need playing. This isn't me bragging though. I know there are many people with way longer lists. As I've said I'm going to use this blog to motivate me and to track my progress. I'll be posting weekly updates here on Destructoid exclusively every Friday. I have a game plan for this too. Right now it's summer but I still have to take one more course to graduate and it's a 3 and a half hour class Monday's, Wednesday's, and Friday's. The length may not seem that long but I have a 2 hour bus/train ride to and from school. On top of that I have work on Tuesday's and Thursday's from 12 to 6 with a 1 hour bus/train ride. Major playtimes are there for restricted to evenings and weekends. However I am fortunate to be able to connect to Steam at work and play some of the more casual games on my laptop (which is very gaming capable). Some games will be easier to get through than others. I don't know what I was thinking today but I bought two of the biggest time sinks on my list in one day. Tropico 3 and The Sims 3. I'm thinking of leaving games like those for last. I'm going to categorize the games into Singleplayer, Multiplayer, and Arcade. Singleplayer is the most straight forward since I just have to get from point A to B in the story. This gets complicated though in games like Fallout 3 were I like to play through multiple times going down different paths (Also note I've beaten the main story in Fallout 3 but my save game corrupted). Actually Multiplayer is the most straightforward. Just play some matches till I feel I've gotten my moneys worth. How much time I feel is necessary is up to the individual game. Arcade. Well not all of the games are necessarily "arcade" games. Puzzle games fit this title. I'm going to add games like The Sims 3 to this category because there's no story or scoring and I don't feel like making a 4th category. This is the more casual time waster category. Also akin to multiplayer since most of these games have no "end" I'll just play till I feel done. I will use some codes to explain my progress in the games.